We hope this message finds you well and prospering in your daily endeavors. This is an exciting time at Good Shepherd Lutheran School as we move more deeply into our Strategic Plan initiatives, which include updating our technology infrastructure, improving our classroom and community spaces, expanding our Middle School, providing more defined road-map for professional development and constantly reviewing our curriculum's scope and sequence. This year's Annual Fund has kicked off and our theme is Preserving the Past, Promoting the Future... One Dream at at Time. A Good Shepherd education offers our children the opportunity to take flight and meet new challenges in the form of academic rigor, engaging in dynamic learning opportunities, developing lasting friendships, and evolving into caring and discerning community members. Tuition is annually set at the lowest possible level; the real cost to educate our kids is actally higher. As a mission-driven school founded upon community, responsibility, love, and respect, Good Shepherd depends on the generosity of our community to help bridge the difference between tuition and the true cost of a Good Shepherd education (the gap). As such, we ask everyone- all families (past and present), graduates of the school, grandparents, and friends to make a contribution to The Annual Fund. Our objective is 100% participation with a goal of $50,000. Any contribution is greatly appreciated, but we humbly urge you to consider $250.00 per child to help close the gap. The money you donate to the Annual Fund is 100% tax deductible and goes directly into the GSLS Operating Budget. We are appealing to you, our valued GSLS supporters, for your gift of a 100% tax-deductible donation to raise much-needed funds for our school. These funds enable us to recruit accomplished faculty, maintain a low student-teacher ratio, support professional development and enrichment opportunities and equip classrooms with the lastest instrcutional resources. As you consider your pledge, here is a glimpse of what is happending after GSLS graduate from our middle school. Best of all, we continue to receive feedback that GSLS students are well prepared for their high school years, and beyond. Ultimately, we hope that you will continue to see the value of a GSLS education for all our current and future students. Upon receipt of your donation, you will be mailed a thank you letter with a tax ID for tax deduction purpose. As always, we appreciate your support in providing the best education for our student, past, present, and future. Tuition covers the vast majority of the annual operating budget; the Annual Fund makes up the gap. Therefore, Rock the Fund contributions help to fund nearly everything that happens at Good Shepherd and our school would look much different without this funding – especially in critical areas: low student-to-teacher ratios, outstanding faculty, expansive enrichment programming, tuition assistance. Why not raise tuition to cover the yearly operating budget shortfall? We set tuition with the goal (1) to price our program competitively within the Novato community; (2) to ensure that the families already enrolled can continue with a GSLS education; (3) to attract a socially and economically diverse student body. It’s a delicate balance. Raising tuition too dramatically or cutting financial aid could be devastating. A strong Rock the Fund campaign allows GSLS to keep tuition affordable and without steep increases while maintaining a superior quality of education. Donations to the Annual Fund are 100% tax deductible, tuition payments are not. 100% participation – We need you! Our goal is for every family to make a gift every year to the Annual Fund. There is strength in numbers – many gifts add up to a large sum each year and every gift makes a difference no matter the amount. In addition, parent participation indicates overall support for the school, which is extremely important to outside funding sources. 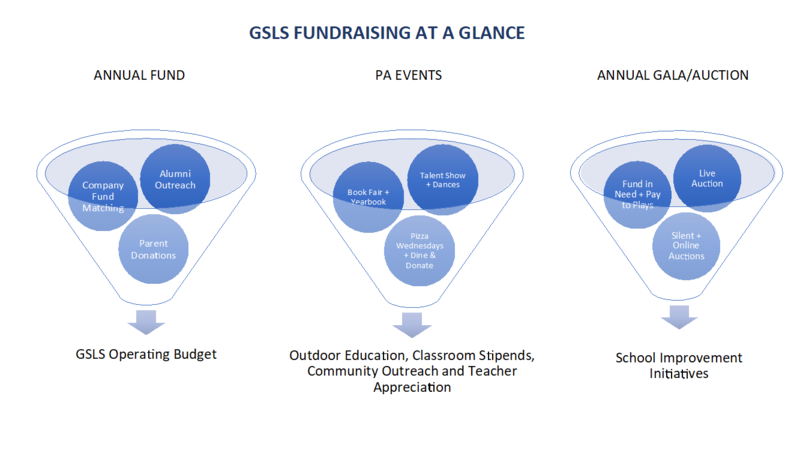 As outlined in our strategic plan, GSLS will begin focusing fundraising efforts outside of our immediate community. One of the criteria that makes us competitive for funding from corporations and foundations is a healthy parent participation rate demonstrated in the Rock the Fund. These donors want to see school communities that support fundraising efforts from within – why should they give if our closest constituents (our families) do not? What is an employer “matching” gift? Many companies will match charitable donations made by their employees. For example, if a parent who works for Wells Fargo donates $1000 to Rock the Fund, Wells will match it and donate an additional $1000 or even $2000. It’s awesome. Many Good Shepherd parents work for companies that have a “matching gift” policy. We are asking all parents to check with their employers to see if they will match gifts to the Annual Fund. If a gift is matched by an employer, the matched amount will be counted toward the parent’s total giving and acknowledged as such. Every dollar counts! Giving is highly personal, and we encourage every family to consider a gift that is meaningful to them. Each contribution is valued and appreciated. Below are some suggested amounts based on a “fair share” calculation – i.e. the shortfall amount between tuition and expense to educate a student. But, again, ANY and ALL contributions are welcome – our goal of 100% participation! What about the Auction funds? Where do those dollars go? Auction funds are not intended to support the operating expenses of the school, but instead are used for “above and beyond” programs and initiatives. Why start the GSLS Flying to the Highest Peak fund late in the year? We made changes to our fundraising calendar this year, moving the Annual Auction and Gala to the fall of 2018. This change shifted our Flying to the Highest Peak campaign to the spring of 2018. We are relying on the Annual Fund to meet our financial obligations for the current academic year. What is the deadline for donations to Fly to the Highest Peak? The deadline is May 5, 2017. Online via the GSLS Website. Check made out to the GSLS Annual Fund and submitted to the office. Credit Card payment on campus during an upcoming event. Pledge Card submitted to the office (with credit card information included). Pledge cards can be picked up in the office or downloaded here. *No matter your payment method, please submit a pledge card and indicate how you would like to be recognized for your donation in communications from the school. Thank you.